The illustration in the cover of this issue shows the mechanism of formation of fullerene and growth of carbon nanotube revealed by quantum mechanics/molecular dynamics simulations. Fullerenes such as C60, C72, C80 and others are known to be formed from small carbon fragments, but little has been understood. 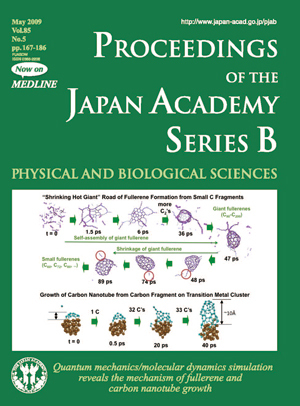 As shown in the top half of the illustration, molecular dynamics simulation by Dr. Keiji Morokuma and his colleagues has revealed for the first time that small carbon fragments around 2000K assemble by themselves at first to form a network of carbon chains, which nucleates to create condensed aromatic ring structure, gaining a curvature and eventually closing to give a cage structure. Cage structures thus obtained are giant fullerenes with 90 to 200 atoms. These structures under continued heating lose carbon fragments (indicated by red circles in the illustration) from the cage to become smaller. They proposed the “shrinking hot giant” mechanism, in which giant fullerenes formed by self-assembly of carbon fragments shrink eventually to give a distribution of fullerenes of different sizes. The bottom half of the illustration shows a similar simulation for carbon nanotube growth. Here a small carbon fragment of C20 was placed on Fe38 cluster (brown particles in the illustration). When carbon atoms are supplied to the Fe-C boundary at 1500K, they reacted quickly and the fragment grew into a cap-like structure and eventually formed a carbon nanotube of about 10Å in length. 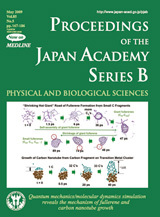 The review by Dr. Morokuma on page 167-182 in this issue illustrates how theoretical/computational studies of structure, function and reactivity of molecules have been contributing significantly in chemistry not only by explanation of experimental results but also by providing better understanding of underlying principles and prediction of unknown experimental outcome.